Gabriel Lugo is a certified Puerto Rico guide. His passion for birding was sparked by an invitation to join an Audubon Christmas Bird Count a number of years ago. A curiosity became a passion and Gabriel was soon making major sightings throughout Puerto Rico, earning a strong reputation with the local birding community. 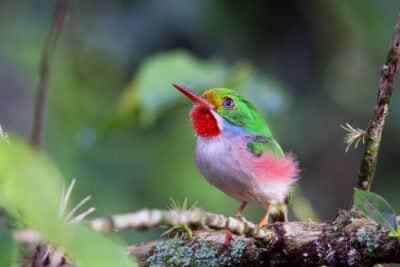 Gabriel has since become one of the top birding guides in Puerto Rico. His contributions to Puerto Rico birding led him to be elected as President of the Puerto Rico Ornithological Society. Gabriel’s eyes and ears have proven him an excellent birder and his contagious enthusiasm helped make him an excellent leader! How did Gabriel come to join Wildside? In November 2010, Wildside’s owner, Kevin Loughlin, was leading a tour in Puerto Rico. While in Maracao State Park, returning to the parking lot after finding the Elfin Woods Warbler, Gabriel arrived with a couple of birders. Striking up a conversation to share where the warbler was found, Kevin was very impressed with Gabriel’s attitude and presence and gave him a business card. That evening, Kevin received an email from Gabriel just saying, “Thank you for bringing people to Puerto Rico to see our birds.” Kevin replied, “Would you like to co-lead my January 2011 tour?” The rest is history!